Any tomato lover will tell you that these garden-fresh fruits taste like little bursts of sunshine. When tomatoes are grown using organic farming techniques, they are also packed with natural sugars, vitamin C, lycopene and other plant compounds that offer their consumers additional protection from the aging and damaging effects of oxidative stress compared to their conventionally-grown cousins. It was the French who named these delightful fruits, “pommes d’or,” or love apples, in honor of their reputation as aphrodisiacs. 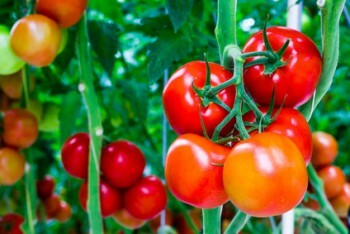 It is Brazil, however, where it was recently reported that, in addition to being full of health-giving goodies, organically produced tomatoes are also around 40% smaller than conventional tomatoes1. This may explain why organic tomatoes tend to be tastier; if they are smaller, they contain less water and hence the tasty little tomato molecules are more concentrated. What’s so stressful about being an organic tomato? Just like humans and other animals, plants, too, are subject to the production of harmful free radicals when exposed to conditions of oxidative stress. In response, these plants produce antioxidant molecules like vitamin C, lycopene and other phytochemicals (plant compounds). You didn’t think they did this for our benefit, did you? What is interesting is that organic conditions are “perceived” by the plants as being stressful. The natural tendency is to think of organic methods as natural, new age and comforting as opposed to bombarding them with harsh chemicals like fertilizers and weedkillers. Some experts believe the stress is down to the low mineral content in organic fertilizers. The idea that stressful growing conditions produce smaller fruits is not a new one. Salt-stressed tomatoes take less time to develop, ripen faster and turn out smaller than normal tomatoes2. This response to stress is not confined to tomatoes or even fruits and vegetables. Mammals, too (humans included), have adaptive mechanisms to cope with developmental stress. The lungs of pre-term infants, for example, develop faster in response to elevated maternal levels of the stress hormone ACTH. It’s like their DNA gets an early warning of a premature birth and ramps up expression of the necessary genes. Should you choose organic tomatoes over conventionally-farmed ones? Ordinary tomatoes aren’t bad for you and they are cheaper. Organic tomatoes, however, are richer in antioxidants. The price differential isn’t that great and organic tomatoes are readily available in most places. If you are fussy about your tomatoes, then it is probably worth the extra expense. On the other hand, some people may not like tomatoes at all. If that is the case, then make sure you take a good multivitamin that has vitamin C, lycopene and all the other important antioxidants in it. 1Oliveira AB, et al, “The Impact of Organic Farming on Quality of Tomatoes Is Associated to Increased Oxidative Stress during Fruit Development.” PLoS ONE. 2013. 2Zushi K, et al, “Developmental and tissue-specific changes in oxidative parameters and antioxidant systems in tomato fruits grown under salt stress,” Scientia Horticulturae. 2009.